This text is based on 2 years of practical experimentation with the participation of lower secondary schools, teachers and young students from all across Europe.The aim of the text is not to summarise or evaluate the project’s accomplishments, but to paint some critical perspective landscapes fuelled by the project; critical as the general mentality in Europe is increasingly working against the innovation agendas promoted by the Commission.In other words the text contributes to an understanding of what further steps should be taken in the core fields addressed.Thus the text might inspire new European initiatives based on and going further than the CHRIS project. State of the art knowledge and practical experience on radicalisation prevention in schools is excellently collated and summarized in the 2016 EU Commission publication “Preventing Radicalisation to Terrorism and Violent Extremism”, produced by the Commission’s Radicalisation Awareness Network. The CHRIS project is guided and directed by this publication, which is demonstrated across the application. 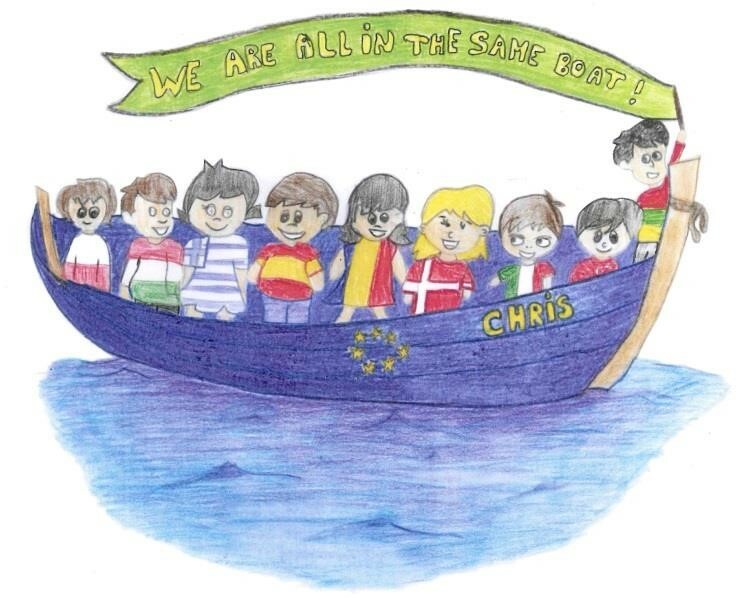 The CHRIS project is one of the first projects in Europe to take the Commission’s Young People’s Co-creation Agenda seriously and to implement this Agenda to create valuable contributions to radicalisation prevention in schools, based on the co-creation of young students from a diversity of European countries. The CHRIS approach is guided by the fact that young people’s co-creation is a SINE QUA NON for efficient and future-oriented radicalisation strategies in European schools. The “CHRIS Schools” project was followed and complemented by a “CHRIS Community” project submitted to the October 2016 Erasmus+ Youth Call and addressing radicalisation prevention in community contexts. The wider perspective is a Knowledge Alliance application to be submitted in 2017 or 2018, bringing together powerful radicalisation prevention resources. The CHRIS project involved young students in lower secondary schools in the development of sustainable ways of countering radicalisation in schools, based on in-depths engagement in what produces radicalisation potential in relation to teenage identity formation and through real-life and real-time community collaboration – and with the aim to build capacity to co-create the project outcomes. The CHRIS project aimed at taking radicalisation prevention in schools to a didactic level and mobilize young students’ hidden and unfolded knowledge to do so. Therefore the project took the participating young student teams through 3 phases of capacity building and co-creation: Feeling Me Feeling School (identity), Open Schooling (reality and community) and Co-creation (design of radicalisation prevention in schools). The project was building capacity and in particular critical capacity among the young students to be co-creating the project results, including through virtual collaboration between the students from the pan-EU partnership and climaxing the collaboration through a 5 days intensive mobility event, the CHRIS Co-creation Encounter. The project aimed at moving radicalisation prevention beyond delivery of content and beyond completed and event-based interventions and towards a didactic level: countering the development of early radicalisation potential through offering young people solid life-wide narratives, (gender) identities and missions, including empowering to political narratives and identities. The project engaged 2 teams of 5 young students from each of the 5 participating schools along the entire project. The young teams will be supported by 2 teachers from each participating schools. The full participation of the young students has been formally endorsed by the school managements, as documented in the Letters of Endorsement attachment. The project’s knowledge partners aimed at guiding and inspirering the project practice and was working with the young teams to produce the final outcomes. The Commission encourages stronger linking between Erasmus+ and Horizon initiatives, bringing research closer to practice and practice closer to research; this obliges the CHRIS to contribute to future radicalisation countering research and policy, based on 2 years practical experience from across Europe. What is the Commission’s Anti-radicalisation Agenda in the CHRIS context? What is called radicalisation prevention is happening and should happen everywhere in society; however, there is an increasing focus on the roles of schools and education in radicalisation prevention: how can schools contribute to preventing young people from radicalisation and to creating sustainable alternative narratives in which the young people at risk of radicalisation can take place? Of course, there is an especially strong focus on early schooling: kindergarten, primary and secondary school. The reason is obvious: the earlier the prevention and the countering measures the more efficient. Radicalisation prevention is in particular important in the teenage years in which the young people are forming their identity and personality. Developing strong identities is expected to be one of the best countering measures to radicalisation and extremism later on in life. Schools therefore become important players in the radicalisation prevention agenda – a challenge schools never faced before. Although many such measures might be similar to schools’ integration roles and strategies across the last decades, radicalisation prevention is somewhat different, more complex, more sensitive and much more “serious”. Basically schools do not know how to do this, and they are not provided with sufficient resources to meet this new challenge. This is the background to the CHRIS project. But what does radicalisation prevention mean in schools? To tell the truth, we do not know that. There has been little systematic research in this field and very little systematic practice. All these roles might work together, but sometimes they are in contradiction. What if radicalisation prevention can be taken to a didactic level, very different from and far beyond the long line of completed events listed above? This is, in fact, the key driver of the CHRIS initiative. what if traditional classroom teaching is not able to contribute to radicalisation prevention? what if traditional classroom teaching by definition works to exclude working with emerging radicalisation potential or risk? what if the traditional Western educational environment (its norms and social practice) contributes to radicalisation in some young people instead of preventing it? what if other forms of learning might offer young people at risk of radicalisation room to reflect on and work through their radicalisation potential? what if for example open schooling/problem based didactics might provide young people with such forms of social learning and interaction that helps work through and re-channel radicalisation risks? what if less academic and formal learning might contribute to the building of more flexible and self-reliant narratives among young people? what if young people at risk of radicalisation, through different ways of organising learning, could be recognised and celebrated for their skills and talents, even though these skills and talents might not be typical academic virtues? what if schools could articulate (“mise en parole”) and act out radicalisation potential? what if, last but not least, different ways of organising learning might provide room for hidden aggression and hatred, not well-accepted in traditional teaching? All these “what ifs” should give rise to many years of serious research, in close collaboration and interaction with the schools and with the young students themselves. One of the major weaknesses in the education systems’ and in our societies’ response to the new radicalisation prevention challenges is that we still seem to create radicalisation prevention for the young people, not with the young people - despite powerful words from such global players as the European Commission and the OECD: this kind of innovation is over, it does not work. Europe is struggling with new generations of young people disengaging from politics and democracy, building resistance towards science and in general feeling school as irrelevant.Europe is also still struggling with what inclusion of (young) migrants means; what works and what doesn’t.Now we are struggling with radicalisation prevention among young people.In all cases the basic approach of Europe is to create measures for, not with. Recent critical youth research is now fundamentally breaking away from these old Western paradigms: in connection with 21st century youth creating innovation for does not work. What we create is simply repeating what they are disengaging from. They do not want to be lectured to. They want to be respected, trusted, and to have their opinions valued and count. They want to follow their own interests and passions. They want to create, using the tools of their time. They want to work with their peers on group work and projects (and prevent slackers from getting a free ride). They want to make decisions and share control. They want to connect with their peers to express and share their opinions, in class and around the world. They want to cooperate and compete with each other. They want an education that is not just relevant, but real. It is possible, of course, to view this list as a narcissistic or unrealistic set of expectations on the part of students. But to do so would be a big mistake. Or one might find this set of expectations incompatible with teaching the required curriculum or with getting better results on standardized tests. But that would be a wrong conclusion as well. What we are talking about here is a fundamental shift in paradigms, including in research paradigms: any (educational) innovation must be co-driven and co-created by the young people themselves to be efficient.This paradigmatic shift is, of course, all the more important when it comes about things like integration and radicalisation prevention.The more “unreachable” the young people, the more co-creation is key.If not for anything else, then because we – the establishment – simply do not understand how these young people think and act.This calls for a radical shift in radicalisation prevention research, strongly recommended in this paper: any powerful research activity in the field of radicalisation prevention in schools must be based on co-creation methodologies to yield relevant results.In fact, the most efficient radicalisation prevention in schools research should be based on a strong community approach, including the students and their families as well as key community players.The European research and innovation programmes should make room for, direct and encourage such research strategies. One of the paramount problems in the CHRIS project and in Europe in general is to explain what “radicalisation” means and how “radicalisation prevention” could take place.Unlike how it appears in some research and policy contexts, the definition of these concepts are far from evident.In fact, we might say that the definition of problems forms part of the radicalisation problem itself.It is indeed a great challenge to explain this to the young students!First of all, it seems as the European radicalisation discourse counts all forms of radicalisation, extremism, terrorism, social violence and anti-democratic behaviour.This means that things like religious terrorism, some football clubs ultra-extremists as well as young people engaging in left-wing organisations are put in one bag and labelled: unwanted behaviour. Then, second, critical radicalisation research has evidenced that it is not possible to define a clear identity of young people at risk of radicalisation.Radicalised young people could be anybody and with all sorts of different backgrounds and motivations.Although aggression, anger, hatred and frustration might be found in all these groups of radicalised youth, such feelings can be developed in all sorts of young people, individually as well as collectively. This calls for critical self-reflection of the typical youth research parameters and it definitely calls for young people’s co-creation.The background to the definition of and approach to these very different forms of radicalisation seems to be a moralistic axiom: all these forms of radicalisation are anti-democratic and therefore unwanted and should be corrected.In its worst versions this discourse simply states: if you are dissatisfied with something, go vote and join a democratic party. The risk of pooling all forms of “radicalisation” and “extremism” in one bag is that we do not understand any of them, and therefore we are not able to address them with relevant measures.In fact, we need critical research to clarify what is “the real content” of the term “radicalisation”. Moreover, we need to discuss how to distinguish legitimate critical civil society engagement from illegitimate radicalisation. The term is definitely negative in its connotations: radicalisation is wrong and should be corrected.In total such research, and the policy-making based on such research, is pure and simply ideological research – unlike recently emerging critical youth research.As we all know, in many political and social contexts radical action might actually be needed, for example in the case of critical youth movements, environmental organisations and similar.Even violent action cannot always be disqualified. Everything is contextual. This challenges the fragile European radicalisation discourse: what kind of radicalisation should be prevented, what not? And, who decides that? Research in the field of radicalisation prevention (in schools and education) needs to go deep and clarify these problems – and openly discuss the premises of the research as well as its possible ideological mission.This is needed to create credible dialogues with school, teachers and students. PART 2 What is “radicalisation” in 21st century Europe, and what does it mean? To understand radicalisation we sometimes need to ask radical questions.Dominating research policy, rooted in social science, might benefit from interacting with other discourses to deepen the understanding of radicalisation. why does it make sense for a young person to engage in a terrorist attack? Why might it in fact be a need to do so? why does it make sense for the football ultras to create violence outside the stadium and attack the other club’s fan groups? Why might they in fact need this? why did it make sense for young people to join the IRA and kill British soldiers? Why might they even need to do that? why does it make sense for young people to join Greenpeace and put their life at stake? Why do they in fact need to do this? In a different from society perspectives, such actions might be necessary and meaningful for the young people involved.To give a small parallel from old Freud: “The neurotic symptom is not simply wrong, it is necessary in the mental economy of the patient”.Similarly, the violent action might be necessary in the mental economy of the radicalised young person.So, perhaps the dominating discourse about radicalisation in Europe is not helpful. It is based on right and wrong, and not on understanding the dynamics behind the action (such as aggression, hatred, humiliation, anger and frustration).This is a great challenge to critical youth and radicalisation research, and in particular it is important to integrate such point of view approaches if schools and learning cultures are to contribute efficiently to radicalisation prevention. To simplify: the learning activities must provide room to move for such radicalised mental economy dynamics. We do not know how to do this, and critical research and practical experimentation need to join forces to find out.To develop such critical research, it is necessary for radicalisation prevention research to reflect on its own mental paradigms and on its ideological bindings. At the same time as we observe various forms of radicalisation among young people in Europe we also witness a general disengagement and disinterest in politics, democracy and European values.The Commission and national governments are increasingly worried about this.The traditional and totally useless response from the dominating European ideologies is to encourage young people to join democratic parties and youth organisations and participate in civic life.We want the young people to discipline themselves into the middle of traditional parliamentary politics. But, what if democracy itself has become obsolete? What if democracy should be redefined in the 21st century? And what if this is what young people react to? But all this is precisely what young people increasingly disengage from: political parties and youth organisations.It does not make sense to them anymore. The political system I obsolete.Some young people simply disengage, others find other forms of “political engagement”, some of which are deemed unwanted by society.Young people’s new ways of political engagement in politics (and society) is of great importance to youth research engaging in radicalisation prevention. CHRIS partners, partly inspired by the CHRIS experience, therefore created a new Erasmus+ initiative by the name of Young Europeans.This project will work closely with teams of young students to find out how the young generation can create their own forms of “politics”, “participation” and “societal involvement”.This project is of great importance to the continued knowledge creation of radicalisation and radicalisation prevention in education. One of the important things to take into consideration when working with radicalisation prevention in schools – and when designing future research initiatives – is that the new 21st century generations might not at all be able to link to the old Europe, its political systems and its educations.The difference between the new digital natives and older generations is much bigger and deeper than ever before in history, and this is the general justification for the co-creation approach.Without the co-creation of young people and students the solutions from the old Europe will not be efficient, but simply mirror obsolete discourses.This is even truer for radicalisation prevention – in research and in practice. The co-creation does not merely address the development of isolated tools or methods; its concerns the political and social discourse itself.Therefore simple isolated measures against radicalisation or to engage young people in politics are not likely to work efficiently.They do not question the underlying assumptions, narratives and paradigms.This represents a giant challenge to the old Europe: providing room to move for the young generations to find their own voice, to redefine politics and to co-create useful radicalisation prevention measures. It will, however, be difficult for the old Europe to start deconstructing its own discourse and provide open spaces for the young generations.Once again, these reflections, in line with recent critical youth research, call for research able to question its basic often unarticulated ideological assumptions and join young students’ co-creation of the entire research circle.This form of research might be the only way to create reliable knowledge on radicalisation prevention in schools. Among groups of young people the 21st century culture seems to produce considerable aggression, hatred and frustration.What is clear is that these energies seem not to be channeled into political engagement or into civil involvement.That does not, however, make the energies disappear; they are still there.The old political systems seem unable to capture and catch these energies.The steam energies need to be let off – and how does that happen?We need to understand that.On top of the general disinterest in politics among young people, caused by the giant gap between the old Europe and the new digital natives, European political practice is making things even “worse”. What will the young people say if we ask them to be interested in middle of the road democracy that more and more appears to most young people as a farce and a joke? This is why we need deep research initiatives creating knowledge about how young people can build political and societal engagement that reflect the world they live in – not the crumbling European democracies.Perhaps the young generations find out that things like democracy and participation – and radicalisation prevention - has to de fundamentally redefined to have any relevance in the 21st century.Research and experimentation need to work closely with the young people to find out. What did we learn in CHRIS that calls for considerable research and experimentation? How did we manage the radicalisation prevention missions in CHRIS? How did the schools manage? Even though schools and teachers are trained in didactics, most radicalisation prevention initiatives are not reaching didactic level. Obviously, these activities are positive and should not be given up.The problem is that these activities do not reach didactic level: the prevention is not linked to alternative learning forms, open schooling or immersive and epic engagement in community activities.The traditional initiatives are based on the assumption that information and examples can persuade young people at risk of radicalisation to give up such mentality or behaviour. The problem is that radicalisation is rooted in deep layers of the young person’s identity and personality (as well as psychological and social economy) and often mobilises deep feelings and energies. This is why counter measures and prevention measures need to be linked to long-term educational and social practice able to channel the strong energies in other directions than radicalisation. The radicalisation potential or risk is, then, used to achieve other aims, objectives and aspirations. In other words, radicalisation energy needs to be “sublimated”.This cannot efficiently happen through completed events or initiatives, but only through offering the young person strong, immersive and epic challenges across the years of schooling.The conclusion is that the traditional education system might not at all be able to prevent or counter radicalisation, but instead actually add to radicalisation. This is where students’ and young people’s co-creation comes in.The real meaning of co-creation is that young students are given ownership to their learning missions and that these learning missions take place in open and dynamic interaction with the community and the surrounding world at large, including internet and social networks.This might at first glance seem superficial and overestimated, but it actually represents a genuine didactic revolution: a shift from being the object of teaching and education to being the subject of learning. This shift challenges the entire fabric of educational paradigms and practices.Successful co-creation can help build independent, strong, self-confident young learning personalities, able and willing to act and this is why this didactic shift might be the most efficient way to prevent radicalisation.In today’s education system it is incredibly difficult for schools and teachers to experiment with this shift and with open problem-based schooling in general.Most present educational mechanisms serve as obstacles to such experimentation with letting the perspectives of the children be the driving force for their curiosity and drive to investigate and thus learn.This is why the European Commission encourages rule-breaking: schools and teachers that start experimentation with the new didactics even if against all odds.Also in CHRIS schools and teachers were only able to take small steps in this direction, even though teachers struggled to use all sorts of “openings” in the restrictive curricula.One of the great lessons learned, not only in CHRIS, is that schools and teachers need room to move to make learning useful to 21st century youth. What were and are the main obstacles to fully implement the CHRIS approach to radicalisation prevention? The conclusion is that extremely important experimentation such as in the CHRIS project must take place against all odds and without support from the education system. RADICALISATION AND IDENTITY – CAN SCHOOLS WORK WITH IDENTITY? CAN SCHOOLS HELP PREVENT RADICALISATION? What important research questions were raised through CHRIS? Efficient radicalisation prevention is expected to happen through linking to the formation of the young learner’s identity. To what extent can early schooling impact this identity formation and create alternative narratives? How can early schooling interact with the deeper levels of radicalisation potential or risk? To what extent can innovative didactics, such as open schooling, offer more efficient early schooling radicalisation prevention than traditional completed activities? What mechanisms in innovative didactics make this possible? What are the differences between traditional academic teaching and open schooling problem based learning in connection with countering radicalisation potential? What mechanisms in open schooling problem based learning might make efficient radicalisation prevention possible? In what ways might students’ co-creation approaches support alternative channelling or “sublimation” of radicalisation risk? How can serious co-creation methods help build resilient and flexible young personalities? To what extent is efficient radicalisation prevention in early schooling possible within the framework of the present education system? What “techniques” are available to pioneer teachers to work seriously with radicalisation prevention within the present curricula? As indicated across this paper such research needs to interact closely and constantly with the young students themselves to deliver credible and relevant solutions. The Commission calls for closer collaboration and interaction between Horizon and the Erasmus+ projects – to help close the gap between research and practice, between theory and practice.In particular for a project like CHRIS, addressing extremely sensitive and complicated realities, such interaction is very welcome.In the field of radicalisation prevention theoretical research will in itself, even if highly qualified, have little impact on the social realities addressed.Successful research needs to interact across its entire research circle with groups of young people, including young people at risk of radicalisation or perhaps already in the process of radicalisation.European infrastructures to link up such research projects with more practical Erasmus+ projects driven by youth organisations and schools with considerable interfaces with the young people should be put in place, supported by more coordination between such initiatives, perhaps even in the projects’ design phases. how can didactic innovation in schools help counter radicalisation? how can problem based open schooling work forms help re-channel the radicalisation potential energies? how can youth organisations in more open and less restrictive settings help build resilience towards radicalisation through immersive community oriented activity? can schools and youth organisations impact radicalisation processes or prevent such processes from being produced at all? what are the basic conditions for impacting radicalisation risk? Mixed partnerships should be requested in the calls and expected action forms should be more precisely indicated. Radicalisation prevention projects can in principle be created across all Erasmus+ sub-programmes; however, most radicalisation prevention projects are expected to be driven by schools and youth organisations.Erasmus+ projects addressing a sensitive and complex field like radicalisation need solid funding and considerable time (to follow the involved groups of young people and the impact of the interventions). Unfortunately precisely school and youth projects are known to be smaller, less resourceful and weaker than for example higher education and vocational training projects. The Erasmus+ and successor priorities and attitudes towards school and youth project need to change, and the programme must make crystal clear the importance for society of such school and youth projects and act accordingly towards the applications and projects.A condition for stronger school and youth projects is that the management of the programme and its successor is returned to the EACEA and managed centralised.The national agencies have lost much credibility along the Erasmus+ programme period and are not expected to be able to manage such re-thinking and empowerment of school and youth projects.Solid Erasmus+ projects addressing radicalisation need 3 years of action and increased funding to allow the needed interaction with young people over considerable time period; to evaluate change and to evaluate the usability of the interventions implemented. In Horizon as well as in Erasmus+ projects addressing radicalisation it should be a methodological requirement to design solid and robust interaction with groups of young people.The calls should in fact request a description of how and with what impact the project will apply a co-creation approach to the young people.Integrated in this requirement should be the composition of the young groups to involve.The idea is that more demanding applications should lead to increased project duration and increased funding.Stronger coordination between research and practical experimentation in the project design phase would also allow much more interaction and synergy between research and practice. Thus, the open schooling approach must allow learning to be embedded in community interaction and child oriented real-life engagement.Through this interpretation of the term “open schooling”, the surrounding community is involved in the school day in a way that supports students' well-being: learning, social interaction and self-determination. Moreover, the open school hereby contributes to variate the school day and differentiate teaching, so that it meets and challenges the individual student's academic level. - what are the mechanisms in opens schooling that not only allows new learning processes, but also allows re-channelling of radicalisation potential and the creation of radicalisation countering narratives? Schools and teachers are in these years overwhelmed with new roles and new challenges: entrepreneurial education, re-thinking science learning, creating innovation interest in early schooling, and: creating radicalisation prevention in schools, just to mention a few.No teachers are able to tackle such challenges, in particular as curricula are increasingly overloaded.This calls for considerable re-thinking of teacher education: not adding to the million things teacher students are expected to master (content), but focusing on how teachers can facilitate and create frameworks for students’ involvement in the new learning activities, in particular in connection with open schooling. The teacher roles therefore need to change dramatically: from subject experts to facilitators of a variety of very different learning initiatives and approaches.This is another heavy reason for the need for students’ co-creation: teachers are not at all able to manage the incredibly challenging palette of 21st century learning visions and activities, and therefore they increasingly need to rely on students’ capacity to co-creation.An important element in the teachers’ training to facilitate open schooling and students’ co-creation is to include facilitation resources from the community and from the organisations and professionals the students’ are interacting with in their open schooling activity. Open schooling is also about sharing the responsibility for the young people’s learning.It is evident that the present teacher roles and teacher resources only allow very limited radicalisation prevention.Radicalisation prevention is sensitive and demanding, and the present teacher roles and resources cannot match such challenges.Therefore the new generations of teachers need a new approach to for example radicalisation prevention, working in open schooling settings, not in classroom and curricula settings. In connection with the CHRIS project and similar projects, it becomes clear that traditional social science teaching is becoming increasingly irrelevant to the young students.Re-thinking social science needs to go far beyond lessons on the composition of parliaments, the election systems and occasional dialogues with local politicians.Social science needs basically to assume the point of view of young generations engaging politics, democracy and what is called European values in new ways.The relation between politics and the young generations are changing dramatically and social science needs to take its starting point in this 21st century reality.As long as social science struggles to make young students interested in traditional politics and democratic systems and civic engagement, the teaching will become increasingly irrelevant to the young generations. are the European political systems becoming obsolete? how does political practice and politicians appear to young people? why do young people increasingly find traditional politics irrelevant to their lives? what is politics in the 21st century and in the globalised world? how can young people develop their own understanding and practice in the field of “politics”? what are the roles of social networks in politics? is there a relation between disengaging from traditional politics and so-called anti-democratic behaviour and action? how can the new generations create and promote a new voice in politics? Basically,we are indicating the need for a paradigmatic shift in social science in schools: from information about political systems and the history of politics to the focal points of 21st century youth.If we imagine such a paradigmatic shift in social science education, social science might be a strong resource to radicalisation prevention in schools. The following critique of Erasmus+ is based on concrete CHRIS experience.As indicated in this paper it is increasingly difficult for schools and teachers to move and to engage in the needed experimentation.As also indicated the European programmes is one of the few opportunities for schools and teachers to engage in educational innovation, as national funding for such activities is becoming scares. Erasmus+ and its successors therefore become extremely important to practical educational innovation in Europe. It is the only Commission programme for educational innovation in practice. One single programme for changing traditional and obsolete education for the new generations of Europeans - this emphasizes the importance of the programme. Based on the CHRIS experience we ask: to what extent is the Erasmus+ programme able to create the needed support measures for schools and teachers to innovate education?We wish to point to some serious weaknesses in the programme, making it difficult for schools and teachers to use the programme efficiently.It is important to bear in mind that Erasmus+ might be the only option for most schools to raise support for the experimentation so strongly promoted by the Commission.In this perspective many schools do not quite understand why Erasmus+, as the successor of the Lifelong Learning programme, seems to have been turned into a sort of discount programme.This does not match the importance of the educational innovation, as described in this paper. In fact we have described the immense obstacles schools and teachers face when making an effort to contribute to the Commission’s educational innovation agenda.A general critique of Erasmus+ is that it has been handed over to the National Agencies.This has led to a long line of strange and less understandable practices in the different projects, as most National Agencies seem to follow own interests and administrative principles.Projects are increasingly oriented towards national interests, not towards European interests.The conclusion is that the management of Erasmus+ by the National Agencies has led to a devaluation of the programme. Several National Agencies are systematically cutting project budgets by 30-40%, making considerable co-financing necessary in the implementation.This and other NA practices seem to threaten a basic and sacred principle in European programmes: the independency of external expert evaluators.This is a serious violation of European principles and should be firmly addressed and corrected by the EACEA and the Commission.The financial structure of Erasmus+ has been simplified compared to the Lifelong Learning programme.This is in itself positive, but the simplifications have also resulted in considerable implementation difficulties for schools.The difficulties are in particular to be found in two major budget areas.School partners are now expected to implement the projects at 250 euro per month.In some countries this amount will buy one single work day per month.Taking into consideration the complications involved in this kind of educational innovation, such an amount can unfortunately only be regarded an insult and a lack of respect for schools and teachers.The extremely low funding of project implementation is a constant frustration and demotivation for most schools.The second major weakness is linked to mobility funding.A project like CHRIS is extremely student-oriented and therefore the project’s 5 days mobility event was the climax of the project – for many reasons, including the quality of the final outcomes.However, the mobility funding is so low and the rules so inflexible that it is almost impossible for partners to bring students and teachers together.Once again this leads to considerable co-funding from the partners, from parents – or from other sources; and it threatens the European dimension of the projects. In general, the Erasmus budget structure is more focused on formal results than on the practice on which the results should be based.In total, for most schools the participation in serious Erasmus+ projects requires considerable co-financing.This is not a problem in itself. The problem is that the Erasmus+ programme is not a co-financing programme, unlike other European programmes. The conclusion is that considering that the Erasmus+ programme for most schools is the only way to support the Commission’s educational innovation, the programme has far too many weaknesses, in the financing as well as in the management of the programme.This calls for considerable re-thinking when designing the Erasmus+ successor(s).